There is no specific reason why I wrote Blessed Are the Contrarians, nor was there ever even any decision to write it. In fact, as the subtitle reads, my book is a Diary of a Journey Through Interesting Times. I mean, I didn’t originally want to write a book, I just came to the decision of writing a blog, that is an online diary, or a daily pulpit, or whatever you want to call it. The book is just a side-effect, so to speak, of the original purpose of creating and maintaining a blog. As a matter of fact, I have collected in this volume some of the pieces which I have posted on my blog over the last few years, namely the most suitable to this traditional mode of communication. 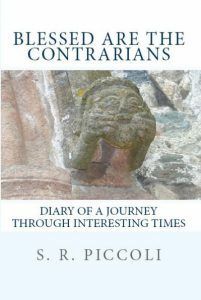 As a result, Blessed Are the Contrarians is a kind of diary of a journey through our time (politics, culture, lifestyles, worldviews, etc.). And, I would add, back home again, where home stands for a sense of belonging to something stronger than the spirit of our times. In other words what this book is all about is explaining—though not in a systematic way—why I disagree with mainstream views in several areas. And this from a conservative and Christian point of view, that is to say the perspectives which, in turn, come under severe attacks from secular and progressive ideologies, namely the most influential schools of thought of our time. To conclude, the question: What inspired you to write this book? should be changed to: What inspired you to create a blog? And the answer is: Simply because I had to. Because everyone is called to witness to what they have seen and heard, and to what they believe in. Thomas Merton once wrote: “We are so obsessed with doing that we have no time and no imagination left for being. As a result, men are valued not for what they are but for what they do or what they have—for their usefulness.” We tend to apply the same scheme of reasoning to God Himself: If God exists, people often argue, then He must busy Himself, otherwise He is a false god. We cannot accept the silence of God, as much as we cannot accept the silence tout court. People perceive it as an uncomfortable and awkward break in conversation, so they instinctively insist on filling the silence, and this because nowadays we perceive silence as an absence, as an emptiness. We cannot conceive silence as meaningful, and even less as one “inhabited” by Someone: a silence “inhabited” by God. This is, in my opinion, part of the problem with our culture and way of life today. Mother Teresa once said: “We need to find God, and He cannot be found in noise and restlessness. God is the friend of silence. See how nature—trees, flowers, grass—grows in silence; see the stars, the moon and the sun, how they move in silence… We need silence to be able to touch souls.” The contemplative experience teaches the discipline of silence as an exclusion of any noise and unnecessary chat, which profane those precious spaces of silence. The true wise man—as a Camaldolese monk, Father Franco, once told me—speaks few words and his “words” are often “silence” at the same time. His words spring from a deep meditation. True silence keeps us away from narrow-mindness. The word is a great thing, but it is not what is greatest: if word is silver, as the old proverb goes, silence is gold. He who aims at the higher levels of spiritual life needs silence as much as he needs his daily bread and rest for his body. “In the attitude of silence—said Mahatma Gandhi—the soul finds the path in a clearer light, and what is elusive and deceptive resolves itself into crystal clearness. Our life is a long and arduous quest after Truth.” May the rest of the Summer be a time of renewal and, as far as possible, of silence, for me and for you, my good readers.